Tony Petitti. You probably haven’t heard of him. But as legendary Orioles PA announcer Rex Barney would say, “Give that fan a contract.” Well, Major League Baseball should reward their Chief Operating Officer with a nice contract, because he was the man behind the changes to this year’s Home Run Derby format. Baseball analysts agreed this was far and away the most exciting Derby of all time. On Twitter, there was even a comment to ditch the All-Star Game and have another one of these on Tuesday. What made it so special? In an ironic twist, baseball, the only major American sport played without a clock, had its premier pre-All-Star Game event saved by the implementation of timed rounds. Along with the clock, the bracketed format added to the excitement with players squaring off against each other, allowing for a buzzer-beater to happen in the sport of baseball. Whoda thunk it. Hometown hero Todd Frazier had the crowd pumped early on in the event when he beat the clock as it went to triple zeroes, eliminating two-time Derby champion Prince Fielder. Veteran Albert Pujols knocked out youngin Kris Bryant, my pick Joc Pederson made quick work of Manny Machado, eliminating him in less than three minutes, and Josh Donaldson advanced to the semis past first-round opponent Anthony Rizzo. All of the upper seeds won, and I was 4/4 on my picks. As the second round, the semifinal round, commenced, many commented on what was unfolding. The vast majority of players from the All-Star teams were staying to watch, contrary to past years where many would leave. Some even went down, took showers, and came back onto the field to continue watching. Advancing to the finals first was, of course, Frazier. 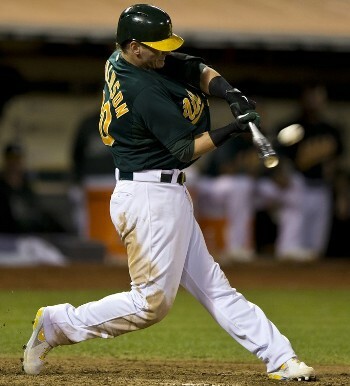 The crowd erupted as he hit the home run that put the nail in the coffin for Josh Donaldson. With that, I was 5/5. On the other side of the bracket, Pederson was the first lower seed to advance, as Pujols had trouble with his batting glove and could not muster the 12 home runs needed to tie. The Machine finished the round with 11, and I moved to 6/6 on my predictions. Also of note, the 130 homers hit in the first and second rounds were more than in any other derby as a whole; and there was still one more round to go. The stage was set for what would become the most riveting, enthralling, captivating, Home Run Derby finales of all time. Joc Pederson used his four minutes efficiently, going yard time after time, and finishing his final round with a total of 14 home runs. The crowd was on its feet and Nationals star pitcher Max Scherzer was doing his part to get the crowd pumped as Frazier stepped to the plate. He had four minutes to drop at least 14 bombs, 15 if he wanted to win and avoid a swing-off round. It was a slow start and Frazier couldn’t get much going. Then, after his timeout (which he took with 2:35 to go and 5 homers), he fed off the energy of the Cincinnati fans and stepped it up a notch. He reeled off homer after homer, and closed the gap as time was running out. He hit his 14th, and had a chance to win it as the buzzer sounded, but the ball fell just short of clearing the wall. However, because he had hit multiple home runs of 425’+, he had 30 seconds of bonus time. It took only one swing and it was all over. The stadium was pandamonium, and Frazier went wild. The players mobbed him, and Cincy’s own had won the masterful power display. I finished 6/7 on my picks, as I had Pederson beating Frazier instead. Be sure to watch Frazier’s entire final round below. This sets the bar quite high for the All-Star Game itself. 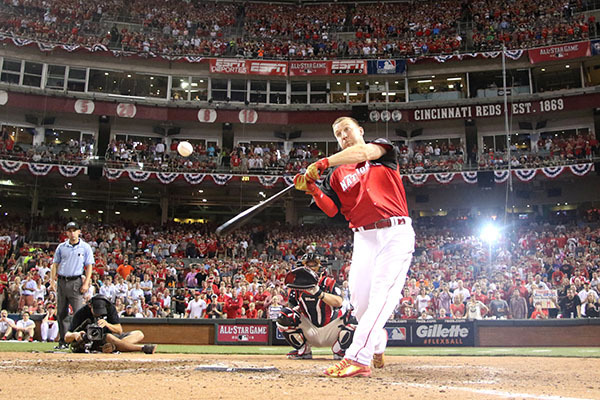 So while the Reds may not be doing so well this season, the Derby and their guy Todd Frazier certainly gave the fans something to cheer about. 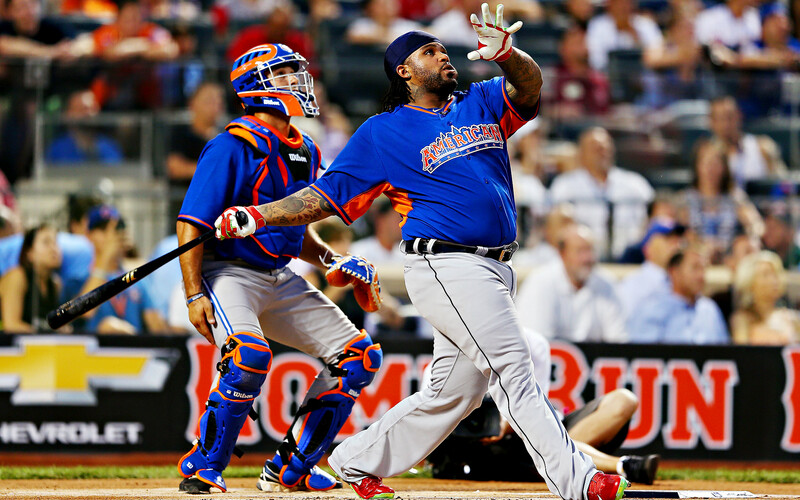 Chris Berman’s booming voice marks what has become a staple of the Midsummer Classic – The Home Run Derby. Some of the most powerful sluggers on the planet convene in one ballpark one evening every summer for a night that consists of mammoth blasts and tape-measure bombs. The Derby has evolved into a fan-favorite, with ticket prices soaring into the hundreds as eager spectators try to nab a home run from the stands. In an attempt to make the Derby more watchable this year, the format has been significantly changed. Instead of the classic “10 outs” format, this year it will be timed. Hitters will have 5:00 to go yard as many times as they can. Additionally, hitters can earn extra time for the distance of their hits. If a batter hits two balls 420’+ during one turn, they earn an extra minute. If a batter hits a ball 475’+, they earn an extra 30 seconds. Personally, I think this is a welcome change, as hitters will be less inclined to take pitch after pitch, waiting for that perfect strike to connect. Also, it is following a bracketed format where the participant with the most home runs this season is matched up against the player with the least. They square-off, the winner advances, and so on. While it is disappointing that sluggers Giancarlo Stanton and Bryce Harper will not be participating in Cincinnati this year (broken hamate bone and personal decision, respectively), along with the two-time defending champion Yoenis Cespedes, the event still promises to be chock-full of entertainment with the A-list that is set to take part. Because of the popularity of the event, I thought it would be beneficial to provide those watching with just about all the information they could need in regards to being prepared for what they see. First, we will take a look at the stadium. 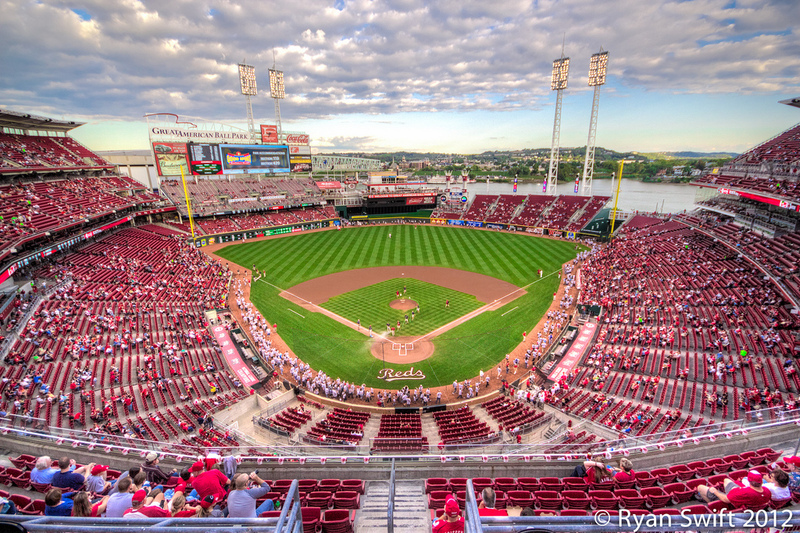 Located along the Ohio River just a short walking distance from Paul Brown Stadium (home of the NFL’s Bengals), the Reds played their first game at Great American in 2003. Affectionately known as the Great American Small Park due to the prolific amount of home runs hit there, Great American has seen quite a number of baseballs fly over its walls over the past 12 and a half seasons. At one point there was even a streak of 70+ games with a home run hit. The dimensions of the stadium are relatively generous, especially to the gaps. It’s only 328′ to left, 325′ to right, and 404′ to center. However, while in most stadiums the gaps are where it’s hard to muscle out a home run, it’s only 379′ to left-center and 370′ to right center. Along with what many believe to be a breeze that blows out towards the river from downtown, we can take a look at the park factor to see just how hitter friendly Great American is. In the 2014 season, GABP (Great American Ball Park) had a park factor for home runs of 113 according to FanGraphs. This was second only to the Rockies’ Coors Field of 116. Essentially what this means is that there are 13 more homers hit at GABP than the average Major League field. For righties, GABP had a home run park factor of 114, once again second to the Rockies at 115. Lefties on the other hand were just slightly less successful, something that will be interesting to note on Monday night as the three lefties attempt to hit a ball out of the stadium and into the Ohio River. GABP ranked fourth at 112 for lefties. 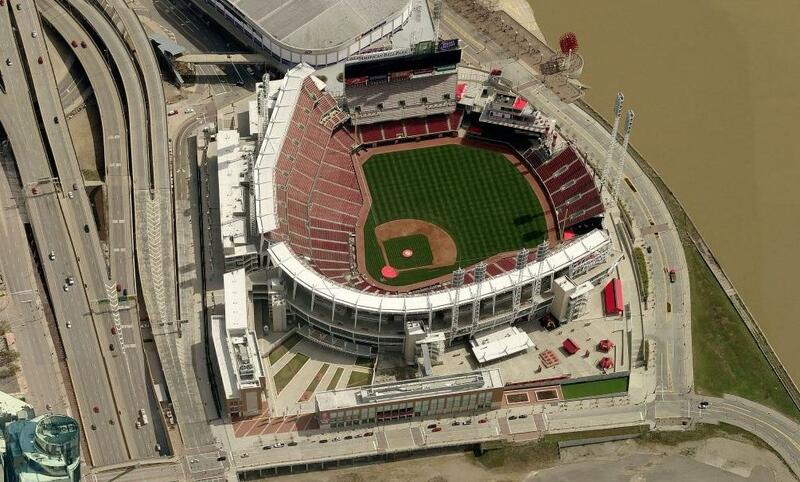 As you can see, the Ohio River is just across the street in right field; accessible by a power shot of a home run. Many watching will be waiting to see if any balls leave the stadium. I have included video from two times that it has been done during a game. Adam Dunn holds the record for farthest home run hit at GABP: a 535 foot behometh in 2004 that promptly exited the stadium in Center field. A second 500’+ shot was recorded by Juan Francisco in 2011 and left the stadium over the right field stands (watch it here). According to the distance calculator provided by the Reds, it looks to require about 500′ of power to blast one into the river. Hitting one into the river also means another significant accomplishment: hitting the ball into another state, as the Ohio there is actually owned by the commonwealth of Kentucky. Next, we take a look at the competitors. It’s a match-up of experience vs. youth. Master vs. apprentice. 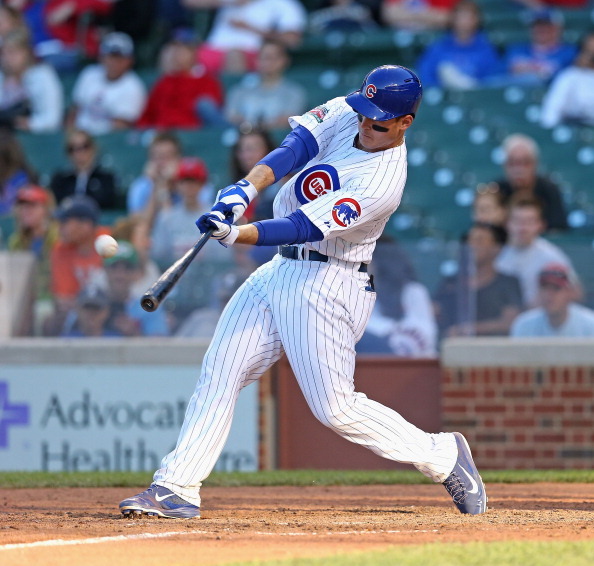 To be fair, Bryant hasn’t been in the majors all season to compile a larger home run total, as he made his debut on April 17th for the Chicago Cubs. His 12 home runs pale in comparison to Pujols’ 26, but Bryant definitely does not lack power. 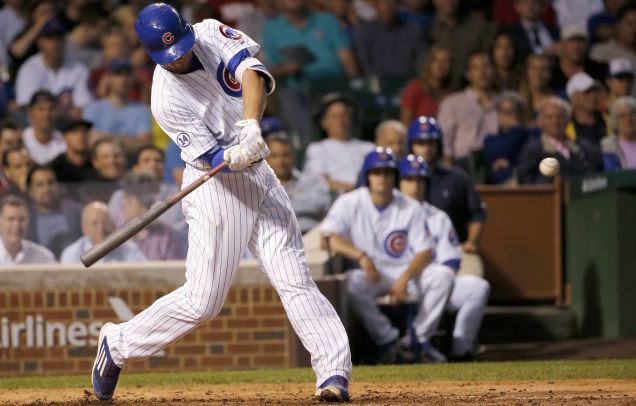 He has mashed some of the season’s longest, including this 477 footer off the Wrigley Field jumbotron. That dinger happens to be the second-longest of derby contestants; second only to Josh Donaldson’s 481′. A third of his home runs have come in the first two pitches of his at-bats. Nine of the twelve have been to either left or left center, a good indication for what is to come on Monday. 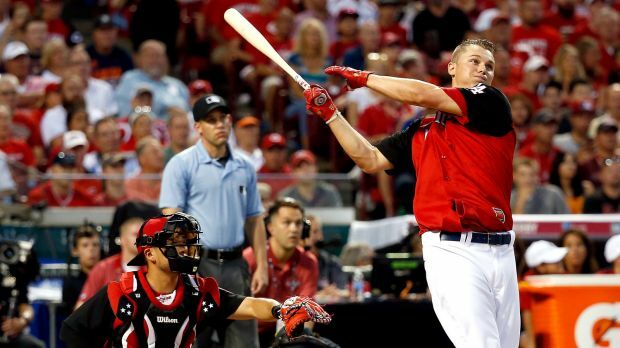 He is considered a part of the new generation of power-hitters, along with the likes of Trout, Harper, Puig, and now Joc Pederson and Joey Gallo. Albert Pujols is entering his fourth Home Run Derby and enters as the #1 seed, but he has never won the event. He performed admirably but lost in the final round in 2003 to Garrett Anderson. He made an early exit in his two other appearances, 2007 and 2009. There’s more info on Pujols because of the much larger sample size, and especially at GABP. From his days on the Cardinals in the NL Central, Albert has visited Cincy and has played many a game in the Small Park, and has knocked 20 homers over his time there. Pujols has been on an absolute tear lately, hitting homer after homer; 18 of his 26 have come since May 27th. Pujols hit the 11th longest four-bagger at Great American with a distance of 477′ in 2003. 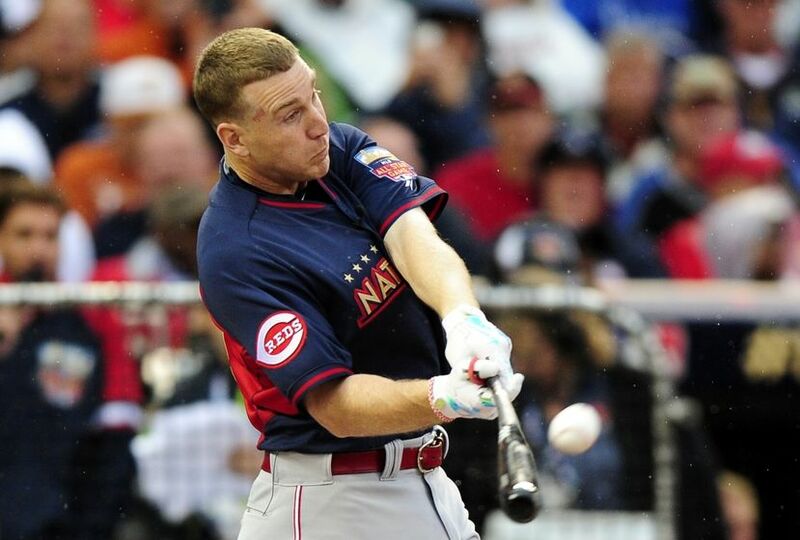 Todd Frazier comes into the Derby as by far and away the crowd favorite since he is the hometown hero in Cincinnati. As Brandon Phillips slowly phases out of the game, and Joey Votto sees patches of struggle, Frazier has evolved into a face of the franchise for the Reds. Frazier knows Great American better than any of the other contestants. He knows its nooks and crannies, he knows the power alleys, and, on top of that, he was the runner-up in the Home Run Derby last year in Minneapolis. In that Derby, it seemed Todd just seemed to do what was needed in order to advance. He only hit 10 total home runs, compared to the winner Cespedes’ 28. In round 3 and the final round, he only hit 1 homer in each round. Frazier enters with 25 home runs and with an average true distance of 398.4′, according to the ESPN Home Run Tracker. Frazier will feed off the energy of the crowd, and it will be interesting to see how he uses his home park to his advantage as he tries to accomplish what he failed to last year. Frazier holds 4 of the 20 longest recorded home runs at GABP. Former Oakland A’s standout Josh Donaldson has been a catalyst of the Blue Jays explosion of an offense this season. ESPN’s Home Run Tracker puts his average speed off the bat at 105.2 MPH, with an average true distance of 408.1′. Donaldson holds the longest home run of derby competitors after launching one 481.2′. His powerful swing will look to do damage as he seeks his first Home Run Derby title. 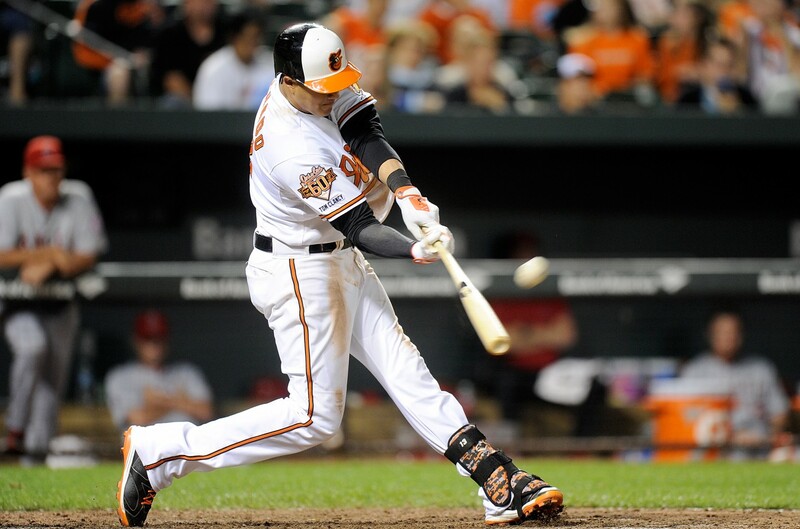 The Orioles’ third baseman, Manny Machado, is known more for his dazzling defensive spectacles, but he has been known to put a charge into one. While his home runs don’t always travel to the moon, he hits a decent amount. Machado has only hit one homer of 430’+ in his career, while Pederson has notched has already notched 11 of such a distance in 2015 alone. Machado does have the top exit velocity of 114.9 MPH. 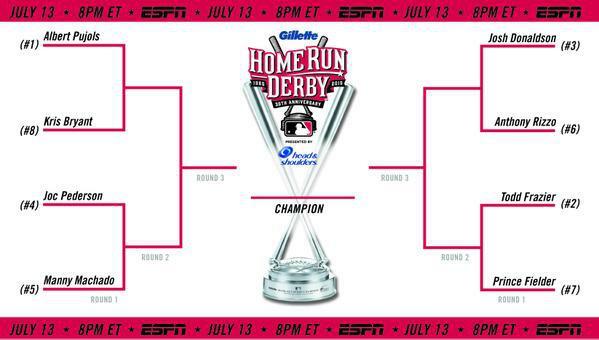 For those of you that are 18 years or older and are interested in winning $5,000, you can fill out a Home Run Derby bracket by clicking here. For what it’s worth, I’ll share what I think will happen, so if you’re making a bracket, you can be sure the opposite of whatever I predict will probably happen. In the first round, I see all four top seeds moving on. I think the only real toss-up is Pujols and Bryant, because Bryant could really put on a display, show up Pujols, and knock him out early. Just not sure this is going to happen. I have Pederson moving on taking care of Pujols in the second round, and Frazier besting Donaldson to move on to the finals. My winner will be Joc Pederson. While it would be fun for the Cincinnatians to see their guy Frazier take home the title, I think he comes up just short again this year. However, Frazier is the betting favorite. Regardless of my predictions, I am fully expecting one of the best home run derbies of recent memory. It will be a sight to see these power sluggers putting their strength on display in the Great American Small Park. So be sure to tune in to ESPN at 8 PM Eastern on Monday Night. And keep your eyes out for excitement besides the hits too; you never know, one of those shaggers may make another crazy catch.